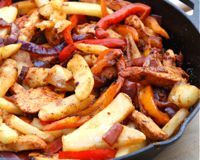 This Latin recipe for chicken stir-fry is known as pollo saltado. It is a close cousin of lomo saltado, a beef stir-fry with chile peppers, vegetables, and potatoes and one of the best-known Peruvian dishes. Pollo saltado includes an onion, red bell pepper, and tomato and it has a great spice. It comes together quickly, especially if you use frozen French fries rather than making fries from scratch. It's also a great dish to use up leftover cooked chicken. It does require a marinade, however, though this can be done a day or two ahead to maximize the flavor. Place the pieces of chicken breast in a plastic zipper bag with the vinegar, soy sauce, honey, cumin, paprika, and aji panca paste. Seal and mix well then set aside to marinate for at least 2 hours, though it can be done for as much as 12 to 24 hours. In a heavy skillet with tall sides, pour 1 to 2 inches of vegetable oil and heat over medium-high heat until hot. Fry the French fries until golden brown, in batches if necessary. Set aside on paper towels to cool. Season with salt and pepper. In a separate skillet over medium heat, heat 1 to 2 tablespoons vegetable oil. Add the marinated chicken and brown quickly on both sides. Add the marinade and cook the chicken for 2 to 3 minutes more, just until it is no longer pink when sliced. Remove the chicken to a plate and set aside. Add the garlic and onions to the skillet and sauté them until soft in the remaining marinade. Add the red peppers and tomato and sauté over medium-high heat until they're just starting to brown. Add the chicken back to the skillet. Season with more soy sauce if desired. Add the French fries, tossing gently, and remove from heat. Garnish with chopped cilantro and served over warm rice. It's true that many of us have been taught that rice and potatoes are not good dinner companions. After all, that is a lot of starch in a single meal. However, in Peruvian cuisine, it is perfectly acceptable to serve potatoes with rice, so you will see it often as you explore the country's food. Look at it this way, you will not go away from the dinner table hungry! How Do You Make Arroz Con Pollo Verde, Green Chicken and Rice?